Plastic free packaging has arrived! Since 2017, it’s been a goal of Inkthre­adable’­s to eliminate plastic packaging from every order we ship. We stated as much in our environmental policy. Today we’re elated to announce that, as of this week, this goal has started to become a reality! For Inkthre­adable, it’s about the impact we have on the environment. The fashion industry is responsible for massive waste, with single use plastics being up there on the list of pollutants that have a visible impact on the world around us. We want to reduce this waste. From this week we’ll be phasing in paper packaging across all product ranges, and expect all orders to ship with plastic-free packaging within 6 weeks. Packaging may vary between orders during this time as new packaging will be phased in when the old runs out. These updates won’t have an impact on the price you pay for shipping. We imposed a strict requirement on the pricing of any packaging updates; we didn’t want our customers footing the bill for lowering our impact on the environment. So, you’ll be pleased to hear that the new paper packaging will come as standard for all orders, without any additional costs. 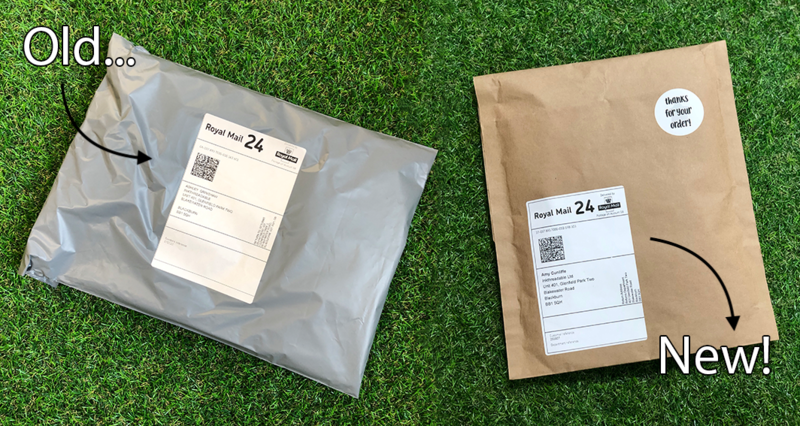 Whilst we’re big on making positive changes to help the environment, we understand that this may come second to product quality to some customers, who would prefer their parcels arrive intact and looking professional. So, this was our second requirement: we needed a paper option that offered the same qualities as plastic packaging. We were pretty picky with the look and feel of the new packaging, searching for an option that could withstand the delivery process and arrive looking professional whilst thoroughly protecting its cargo. We think you’ll agree we settled on a winner. Our paper postal mailing bags are manufactured from responsible, sustainable sources to comply with FSC® certi­fica­tion. The paper is both compostable and degradable, and paper mailers can be easily recycled, making this an extremely eco-friendly option. The weather-proof parcel protects its contents as well as our old plastic mailing bags, and through testing we’ve found it holds its shape very well and arrives in a great condition. With mugs shipping in shatterproof cardboard boxes, posters in triangular tubes (no plastic stoppers on the ends), cushions in kraft paper wrapping, and other accessories shipping in reinforced cardboard envelopes, we can now confidently say that all but one product will ship plastic-free in 6 weeks time. Canvases won’t ship entirely plastic-free. These will always ship wrapped in biodegradable bubble wrap to protect them from the rigours of delivery. Canvases are a fragile product, and we’ve yet to find a suitable alternative to bubble wrap, so for the foreseeable future this will not change. To help on this front, we’ll soon be including unbranded inserts with canvases to offer fun, alternative uses for the bubble wrap rather than throwing it away! Bubble wrap is reusable in the home for various things, from storing delicate items to arts and crafts with the kids, and we always recommend reusing when possible. However, if our bubble wrap does end up in a landfill it will degrade within 12 to 24 months. Plastic waste has been a hot topic since David Attenborough’­s shocking message about the impact of single use plastics in the final episode of Planet Earth II. The fashion industry is already reacting, with paper bags now being used in many high street stores. But single use plastics have remained prolific with online retailers. We believe it’s time for change, and as a supplier to online retailers it’s our respon­sibility to set an example in the industry. As a customer of Inkthre­adable, your brand can now offer something that the big online fashion retailers can’t - plastic free packaging for all online orders. It’s big news, and worth shouting about on your own store.